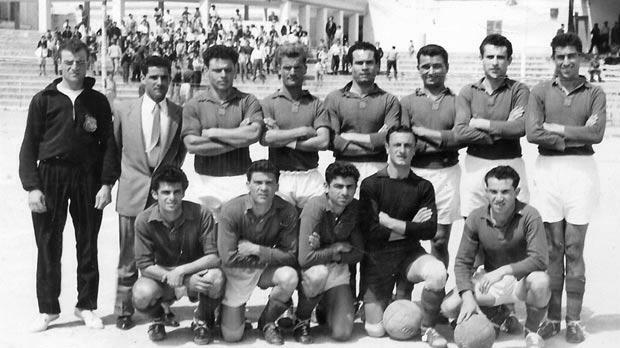 Marsa FC – 1955-56 Division Two league championship and cup winners. In 1955-56, for the first time since the Second World War, the Division Two league was composed of only one section. Eight teams took part in this championship which, for the first time ever, was played on a two-round basis. These reforms made the competition even more attractive and, of course, there was an increase of interest from the spectators. The attendances at the stadium on Sunday mornings improved considerably and at times even rivalled those of the afternoons when the First Division league was played. The Third Division was also reformed. This category was trimmed down to two sections, composed only of teams representing a district. Division One second teams and Third Division clubs were organised into a reserves league. Thus, another step towards the unification of the league was taken and now all three divisions were firmly established on a strictly one team per district basis. Season 1955-56 was a memorable season for Marsa FC. The Red-Blues won promotion to the First Division for the first time in their history and also carried off the Division Two cup without suffering a single defeat in both competitions. Sweet memories were rekindled in Marsa of the good old days before the war when the town was represented in the league by Marsa United. The exploits of the ‘Scarlet Runners’, as the team from Marsa was known in those days, were still fresh in the mind of the football old-timers. Marsa dropped only two points in the league in drawn matches against Żejtun Corinthians and St George’s. Żejtun and St George’s were Marsa’s chief rivals that year. Marsa drew 0-0 with St George’s in the first round but in the second round they won a keen encounter 3-2 to open a two-point lead over their nearest rivals which they kept up to the end of the competition. In Żejtun, Marsa found another tough nut to crack. It is true that in the first round they won the direct encounter 2-0 but in the second round Marsa had to settle for a 0-0 draw. At the other end of the table, the relegation battle remained open up to the last match of the competition when St Patrick beat Mosta 1-0 to make sure of remaining in the Second Division. That result left Birżebbuġa St Peter’s stranded at the foot of the table with only five points to show for their efforts. In the knock-out quarter-finals, Marsa struggled to beat Melita and win a place in the semi-finals. This was an exciting game with both teams playing the kind of attacking football one associates with cup ties. Both teams created and took their chances but in the end it was Marsa who won the game by the odd goal in seven. St George’s finished second in the league only two points less than Marsa. So, the Saints set their sights on the cup competition in an attempt to save their season. In the quarter-finals, the Saints met Żejtun who were also among the promotion contenders. The league encounters between these two teams were close affairs but in the cup, St George’s went on a rampage and beat the Corinthians heavily 5-0. Marsa and St George’s were drawn apart in the semi-finals, making the chances of a final between the two major contenders still possible. However, while Marsa beat Mosta Athletic 6-1, the Saints were surprising beaten by Gżira United 2-1 in the other semi. The Maroons occupied a mid-table position in the champion-ship that season and the difference between them and Marsa was too big for them to bridge. In the final, Marsa produced one of their best matches and beat Gżira 3-0 to complete a memorable Division Two double.